Papaya or Carica Papaya is a perennial plant that grows in both tropical and sub-tropical regions. It is native to tropic American countries like Mexico and California. They grow well in several countries like Africa, India, Florida, Philippines, Caribbean Islands, Thailand, Indonesia, Malaysia, Australia, and Hawaii. 4 How to Grow Papaya Tree from Seeds in a Pot? 5 Grafting Papayas |Can I Graft Papayas? 7 How to take Care of Papaya Trees? 8 What are the side effects of eating papayas? 9 How do you pick a ripe papaya? 10 How long papaya tree lives? Papaya is a small sparsely branch tree with a single stem growing about 5 – 10 meters. The leaves are confined at the top of the trunk. Leaves are large about 20-40 centimeters in diameter with 7 palmate lobes. Flowers are parted; male flowers have stamens fused to the petals, female flowers have a superior ovary with 5 petals connected at the base. Papaya flowers are sweet-scented, open at night and pollinated. Fruit is a large berry about 20-35 centimeters tall. Papaya fruits can be eaten or juiced. It can also be used in ice-creams, desserts, cakes, sauces, jams, smoothies, chocolates for flavoring. Papayas love to grow with beans, banana, sweet potato, comfrey, climbers, flowers, nasturtiums and other nitrogen-fixing plants. These companion plants protect papaya tree from harmful pests and diseases. But also promotes plant growth resulting in fast and tasty fruits with high yield. 100 grams of papaya contains 43 calories, 11 grams of carbohydrates and 8 grams of sugars. It is cholesterol free and low in proteins. Papaya is a good source of vitamin A, vitamin C, calcium, magnesium, iron, vitamin D, vitamin B6 and vitamin B12. 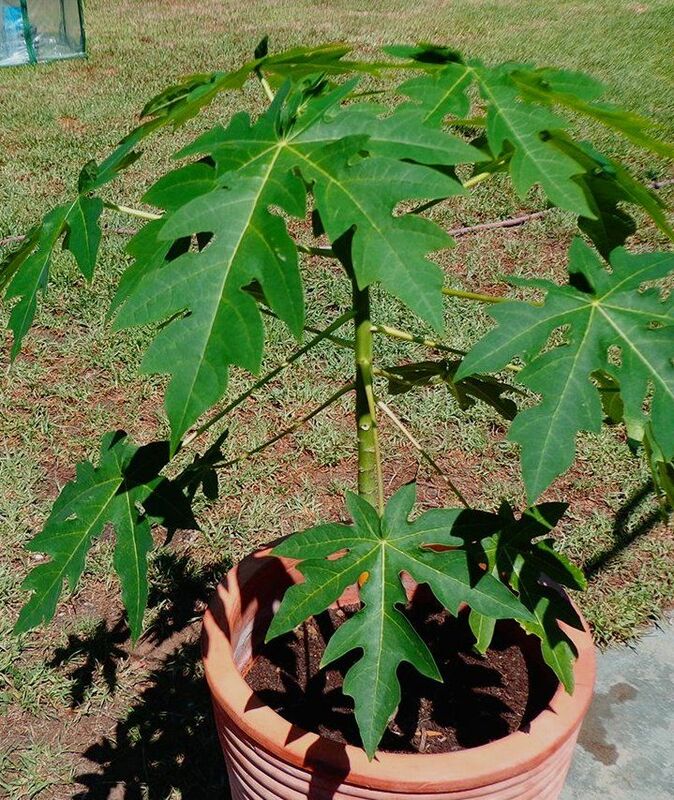 How to Grow Papaya Tree from Seeds in a Pot? Growing papaya is usually done by collecting the seeds from the ripe fruit. Here is the step by step procedure to grow papaya tree from seeds ….. Select a seed variety to grow them in pots. Prepare a potting mix rich soil. Provide sufficient water and sunlight to the plants. Papaya requires good N-P-K fertilizers to thrive faster. Use organic fertilizers to deter pest and disease problem. Harvest papayas when fruit turns yellow in the hot-temperate zone. You can select the seeds from papaya fruit to grow it in pots or purchase hybrid seeds from nursery or garden center. Papaya seed varieties are based on size, taste, growing regions and fruiting time. Choose a big pot or container about 15-20 inches to grow dwarf variety papayas. For tropical plants such as papaya choose a nutrient-rich potting mix soil. You can prepare the soil by adding garden soil to the compost in the ratio of 1:2. Papaya grows well in loamy, sandy or rocky soils with a pH of 4.5 – 8.0. Water thoroughly and monitor the moisture levels by keeping the soil damp but not soggy. As it grows to increase the amount of water supply to the plants. Prefer full sun for better growth. If you start growing papayas indoors make sure the plant receives sunlight minimum of 6-8 hours a day. Papaya fruits thrive faster in warm climatic conditions. To maintain the best temperature to produce tasty fruits is 70 – 90 F. It can also damage plant growth if the temperature is below 31 F.
Now sow the seeds in large containers. Spacing should be 2 inches apart from each other. To germinate the seeds quickly, use sterile potting mix soil such as vermiculite. Seedlings may appear after 2 weeks. Dwarf varieties grow to a height of 6 feet. To develop papaya fruit pollination is a must. Pollens must be transferred from male gametes to the female gametes in plants. Flowers cannot transfer pollens by their own, so they attract insects such as honeybees, butterflies, and birds to transfer pollen grains for the fruiting purpose. Nutrition deficiency is the major problem in all edible plants. There may be several reasons for nutrient deficiency in plants such as sunlight, watering and soil nature. Here is the list of elements and symptoms in plants that affects the plant growth. To deter pests and diseases, spray ammonium sulfate solution on papaya plants. Pests or insects don’t like this solution and hence be away from plants. You can prefer other organic methods to overcome this problem. Papaya trees require better fertilizers to ensure fast growth and development of the fruit. Apply fertilizers such as N-P-K (Nitrogen-Phosphorus-Potassium) on plants in the ratio of 10-10-10 or 14-14-14 for root establishment. You can also add organic compost, manure or mulch to the soil. Harvest papayas only when fruit turns yellow. Papayas are ready to harvest after 6-9 months from seeds in the hot-temperate zone. It takes 9-11 months time to harvest in moderate temperate zones. Cut papayas using gardening tools (sharp knife or scissors). If you left it to ripe then mosquitoes and birds damage the fruit. Before eating store them in a refrigerator for 2-3 days and consume the fruit when it is half yellow. Grafting Papayas |Can I Graft Papayas? Grafting in papaya can be done between 2 different varieties to form a single hybrid plant. It produces tasteful fruits and promotes high yielding for a long time. Here is the procedure that illustrates grafting in papaya. Choose the time for grafting papayas as it requires enough nutrients to grow. Select scion which is a young stem from the plant to establish leaves and flowers. Now select rootstock plant that is healthy to which the graft is attached. Cut the stem of scion below graft and rootstock stem above graft in the desired shape using a knife. Join both scion and rootstock (simply say graft) in the desired shape and wrap it with a grafting tape. Now plant the newly established graft in a container. Water regularly as it requires plenty of water to thrive and provide sunlight for better growth. Papaya is a natural remedy for treating many diseases like heart problems, cancer, atherosclerosis and digestive health. Boost Immunity: Immune system protects you against various infections that make you really sick. Vitamin C in papaya makes you build strong immune system. Arthritis: Arthritis is a deadly disease and may reduce lifespan significantly for those who suffer from it. Eating papaya is good for your bones and has inflammatory properties that can control arthritis problem. Easy Digestion: Papaya contains an enzyme called papain to treat digestion problems. It is also high in fiber and water content to prevent constipation, promotes regularity and healthy digestive tract. Improves Heart Health: Potassium and vitamins in papaya help to deal with heart disease. An increase in potassium intake in your diet reduces the risk of cardiovascular disease and other heart problems. Weight Loss: Papaya is also good for the people who are trying to lose weight naturally. Eating papaya in the morning or evening snack times is good for your health as it promotes the feeling of fullness and controls cravings. It is also beneficial for promoting wound healing and prevents infections in burned areas. Cancer: Consumingbeta-carotene found in papayas may reduce the risk of cancer. It also plays a vital role in curing prostate and breast cancer for women. How to take Care of Papaya Trees? Pruning is not required in case of papaya plants. Place mulch over the top of the soil to maintain moisture levels. Keep children and pets (dogs & cats) away from harmful tools and fertilizers. Follow instructions on seed covers when you purchase online before planting seeds. Harvest fruits early in the morning and do not expose it to the sunlight. For grafting papayas successfully maintain temperature, water, and sunlight as required. Make sure the pot has holes at the bottom for enough drainage and to make the soil moist. What are the side effects of eating papayas? Consuming papayas in large amounts is unsafe and damages the esophagus system (food tube in throat). When you apply it on the skin as latex causes severe irritations and allergic reactions in some people. How do you pick a ripe papaya? Look for yellow papayas or little green color. Fruit turns bright yellow when it is fully ripe. Also, prefer a firm papaya with smooth skin and big size. Avoid damage, cut or the soft fruit. How long papaya tree lives? Papaya plant does not survive in frost due to heavy wind, drought and shade conditions. After 4-5 years you can replace plants and some other varieties may live longer if not uprooted. But there may be chances of reducing fruit production after 4 years. Start growing papaya from seeds in a pot or large container that produces juicy fruits and monitors your health. If you have amazing ideas about growing papayas, please share your experience with us. This fruit also has some essential standard health benefits as effectively. Therefore, below are some health rewards of the papaya fruit:Eye Wellness Advantages: According to a research performed by the Archives of Ophthalmology ingesting at the very least 3 servings of fruits a day including fruits such as Papaya can assist to minimize your pitfalls for the age associated eye condition macular degeneration. Furthermore, this sweet tasting fruit also consists of the vitamins A, C, and E critical antioxidants helpful in improving vision and guarding eyesight health. Do you thing it is ok to add ”chicken fertilizer plate” and ”20-20-20 NPK” to its soil for growing faster and better?